When NHL legend Ken Dryden was about to publish his book, "Game Change", he got in touch with Harvard psychologist and linguist, Steven Pinker, who was about to publish "Enlightenment Now". Their common ground: what does it actually take to change someone's mind? Pinker also happens to have grown up in Montreal, and idolized the former Canadiens goaltender. The two talk to Paul Kennedy about the relationship of rhetoric and reason. 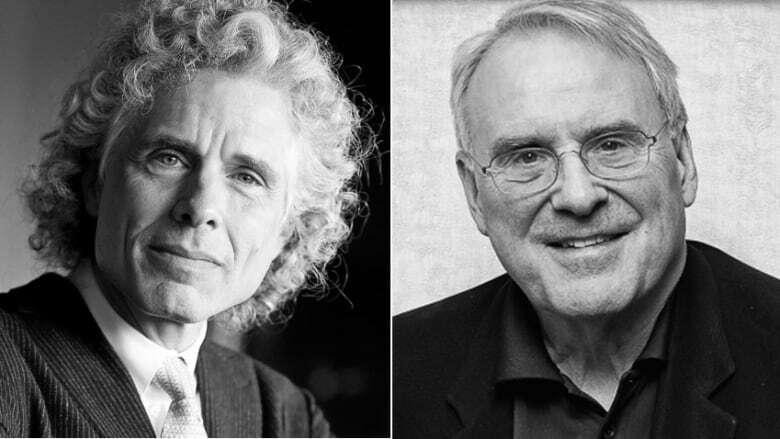 When NHL legend Ken Dryden was about to publish his book, Game Change, he got in touch with Harvard psychologist and linguist, Steven Pinker, who was about to publish Enlightenment Now. Their common ground: what does it actually take to change someone's mind? Pinker also happens to have grown up in Montreal, and idolized the former Canadiens goaltender. The two talk to Paul Kennedy about the relationship of rhetoric and reason. **This episode originally aired March 13, 2018. Hall of Fame goaltender Ken Dryden wants to change not just the rules of hockey, but the entire culture of the sport. There are simply too many serious head injuries, and the thinking behind the rules governing the game has lagged behind the realities of how it's actually played. Pulitzer Prize winning psychologist Steven Pinker believes that Enlightenment values have had their stock lowered on both the right and left, and he would like to see them resurrected — values like reason, science, humanism and progress. Too often, truth gets personalized. And we lose sight of the fact that life for most people has improved compared to any other epoch in history. And we owe that improvement, he argues, to the Enlightenment. Progress in particular almost appears antiquated as an ideal. But both are firm believers in the notion that it is still viable, perhaps more than ever. Whether it's a sport in particular, or a society in general, changes for the better not only can be made; they have been made. Ken and I met, I think [in] 1996, approximately. Ken was doing a series on learning and the brain for Ontario public television. I remember getting a call out of the blue from a filmmaker who called himself Ken Dryden. And [I was] thinking at the time: wow, what a coincidence! He has the same last name as the immortal from the [Montreal] Canadiens. And as the conversation proceeded — it was a very pleasant conversation — and the filmmaker at the other end said that he is well familiar with Boston. And at one point [I thought]: you're Ken Dryden! We had a very pleasant lunch, and Ken recounted all the great memories that he had of coming to Boston every spring, and winning! I started reading Steve's books when he was writing about language. And I thought they were just unbelievably interesting, and about something that that — notionally — should not have been interesting… and then I just kept reading him. And then the last the last book of Steve's that I read was the 'The Better Angels of Our Nature'. And I couldn't believe how — again — interesting and challenging a book it was. And how he took something that was so indisputable, about how violence was really getting worse, and worse, and worse — and everybody knew it was even beyond discussion or debate. And then in the way in which Steve does things, of just relentlessly looking back at what was, as opposed to what we remember. I was teaching a course at McGill called "Making the Future". And I wanted to get students to think about the future, not just to learn about the present and the past which they would do in the rest of their academic courses. And Steve's book was one of two that I assigned every year, in part because of how interesting it was about violence, but even more than that. Here are these students who are 20 years old, 21 years old, and almost every adult in their lives is telling them about how things are worse and worse and worse, and that the world is going to hell in a handbasket. And if they are going to make a future they have to believe that, in fact, a better future is possible. And so this was the book that really I wanted them to read, to help reinforce in their minds that they had the right to hope and the right to believe that the future that they would live would be better than what was and is. People tend to moralize the status quo, that the there's a way of doing things that allows us all to get along reasonably well. And to challenge that is often seen not only as not particularly moral, but sometimes as immoral. Why are you going to mess up a nice harmonious society? [But] our cars are safer. We put up with seatbelts — that's another example that in the 50s and 60s would have been considered neurotic to to wear a seatbelt while you're driving. Airbags. Drunk driving — another example that was a source of comedy through the 80s. There was a movie called Arthur with Dudley Moore, and one of the funniest scenes was when the protagonist gets drunk and cracks up an expensive sports car. It's almost horrifying to watch that now because we think of drunk driving as something that kills children. And thanks to Mothers Against Drunk Driving, they reframed that practice from an act of comedy to an act of criminality. I don't think we really understand it. It's one of the great puzzles of social science. They just see these trends that seem to sweep along. But there's no such thing as a trend to make society safer. There are people who invent seatbelts, and there are legislators who pass laws, and there are car-makers who install them. And even though looking back with a bird's eye view, you can pretty much say that something is inevitable. Really, when you say 'inevitable' what you mean is sooner or later someone actually presses the button, someone makes the argument, someone rallies the supporters. Some of it is laying out concrete suggestions as Ken does in 'Game Change'. You can't bring head injuries to zero most likely, but you can reduce them a lot — and to adapt a quote from former President Obama: he would have to tell his staffers [that] 'better' is good. Because they would always say: well, that won't solve the problem… they're still be unemployment. Yes, but if there's less of it, that is progress. Ken Dryden has been a politician, lawyer, and Hall of Fame goaltender for the Montreal Canadiens. He's also the author of numerous books, including: The Game (1973), Home Game: Hockey and Life in Canada (with Roy MacGregory, 1990), and Becoming Canada (2010). His most recent book is Game Change: The Life and Death of Steve Montador and the Future of Hockey (2017). Steven Pinker is a Harvard professor of psychology and Pulitzer Prize winning author of books on linguistics, neurocognitive science, and computational theories of mind. He's a prolific author, and among his many books are: The Language Instinct (1994), How the Mind Works (1997), The Blank Slate (2002), The Better Angels of Our Nature (2011) and The Sense of Style (2014). His most recent book is Enlightenment Now:The Case for Reason, Science, Humanism, and Progress (2018).